There are more than a few Karaoke video games out there, from Karaoke Revolution to SingStar to Lips. Each of these games come with dozens of songs per disk—and some allow for more songs to be purchased as DLC. But Joysound Dive goes a step beyond these and quite literally takes the Japanese Karaoke experience right to your living room with 90,000 songs for you to sing at your pleasure. 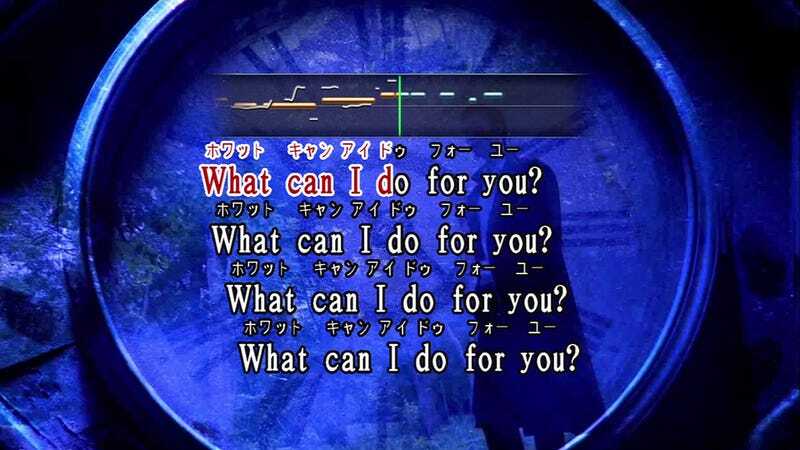 Instead of forcing you to buy individually each song you want to sing, Joysound Dive goes for the "all-you-can-play" model. The game itself is free on the PlayStation Network, but to actually start singing you have to buy a ticket. These tickets range from 300 yen ($3.30) for 24 hours of play to 1000 yen ($11) for a month of play. As long as you have purchased a ticket, you can choose any of the 90,000 songs and sing to your heart's content. Moreover, this price is far cheaper than going out to rent your own Karaoke room in Japan (which can easily cost over 1000 yen for an hour or two of singing—far more with food and drink included). But even if you prefer that social setting, Joysound Dive is still the perfect tool for practicing your favorite songs so you can show off your singing skills on a night out with your friends. There isn't a lot of "game" to Joysound Dive. For the most part, it simply turns your PS3 into a Joysound karaoke machine like the thousands that exist in karaoke clubs across Japan. That said, it does have a few game-like features. The first is that you can enable a vocal line bar like the ones in everything from Karaoke Revolution to Rock Band. It doesn't actively score you on how well you're doing, but it does give you some visual feedback when you are trying to learn a song. The other game-like feature is Challenge Mode that pits you against the rest of Japan in a massive versus battle to see who is the best singer in Japan. In this mode, you pick one of the 100 most popular songs on Joysound Dive; and as you sing, you are taunted by the names and scores of the best singers of that song. Should you break the top three, your username will be added to that list in Challenge Mode for all the world to see. As expected, the vast majority of the music in Joysound Dive is Japanese, and so very nearly every J-Pop, J-Rock, and Enka hit from the past half a century is included. The anime collection is great as well and has theme songs from many older and obscure anime—not to mention many of the insert songs that pop up in only a single episode here or there. The English song collection, on the other hand, is very hit or miss because it is filled only with English songs that have been popular in Japan. And while many American and British artists become popular in both the West and Japan, many more do not. So even if a song is a mainstream radio hit in the West, there is no guarantee it will be on Joysound Dive. I've previously shown you some of the video game music in Joysound Dive. However, it is actually somewhat lacking in that department compared to the karaoke machines at the karaoke clubs I frequent. There were no songs from Metal Gear, Katamari, or the Sonic Adventure series. There wasn't even a version of "Eyes on Me"—the first time I have ever seen it absent at karaoke. In the end, Joysound Dive really does bring the karaoke club experience into your home. You'll find plenty to sing whether you speak Japanese or not. But while 90,000 songs is a lot of music, Joysound Dive feels like the kind of machine you would find in the cheapest of karaoke clubs—one with many songs you know and many more that are conspicuously absent. That said, if you live in Japan and love karaoke, Joysound Dive is easily worth the meager price of admission. Joysound Dive was released on November 23, 2011 for the PlayStation 3 in Japan. It is region locked and there are no plans for an international release.